The Source Paulownia is an uncompromising SUP shortboard that offers exceptional stability for a board of this size and volume. 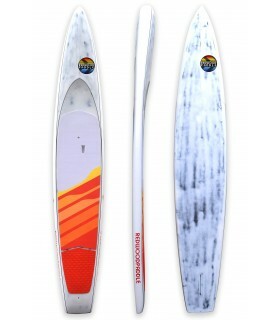 Designed for fast acceleration off the top and bottom of the wave as well as short and aggressive turns. Ultra light under the feet: it will put you exactly where you want to be on the wave. Compact, stable, thin rails: a "pure surf" shape. A brand new addition to the Source range; the Source 9'3 Paulownia comes with a stunning wood and tinted resin epoxy finish. Designed for intermediate riders weighing up to 85kg or for more advanced riders weighing 85+ kg. Using a lighter EPS HD foam has enabled us to reduce the weight of this board by 800 grammes. The ebony sandwich layer has also been modified, it's now thicker (increased from 0,6 to 0,8 mm) which makes the board more rigid under your feet and more solid throughout. The board comes equipped with a set of 5 fiberglass quad fins (standard Future) + a 6.5" central fin and can be ridden as a 2+1 or a quad.